January birthstone angel with Garnet (burgundy red) tinted wings has a sparkling gold halo, praying hands and a meshed woven glass gown. 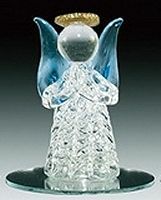 This charming spun glass angel figurine is set on a beveled round mirror base and is perfect for party favors or memorial gifts. February birthstone angel with Amethyst (purple) tinted wings has a sparkling gold halo, praying hands and a meshed woven glass gown. 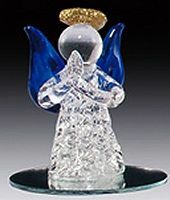 This charming spun glass angel figurine is set on a beveled round mirror base and is perfect for party favors or memorial gifts. April birthstone angel with white Crystal-like wings has a sparkling gold halo, praying hands and a meshed woven glass gown. 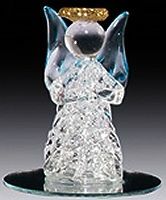 This charming spun glass angel figurine is set on a beveled round mirror base and is perfect for party favors or memorial gifts. May birthstone angel with Emerald (green) tinted wings has a sparkling gold halo, praying hands and a meshed woven glass gown. 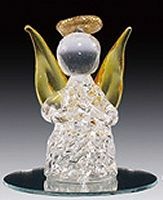 This charming spun glass angel figurine is set on a beveled round mirror base and is perfect for party favors or memorial gifts. June birthstone angel with Rose Quartz (rose) tinted wings has a sparkling gold halo, praying hands and a meshed woven glass gown. 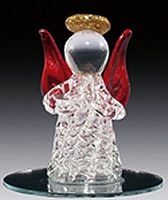 This charming spun glass angel figurine is set on a beveled round mirror base and is perfect for party favors or memorial gifts. July birthstone angel with Ruby (red)tinted wings has a sparkling gold halo, praying hands and a meshed woven glass gown. 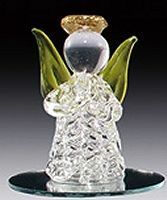 This charming spun glass angel figurine is set on a beveled round mirror base and is perfect for party favors or memorial gifts. August birthstone angel with Peridot (light green) tinted wings has a sparkling gold halo, praying hands and a meshed woven glass gown. 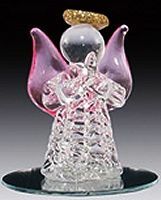 This charming spun glass angel figurine is set on a beveled round mirror base and is perfect for party favors or memorial gifts. September birthstone angel with Cobalt Blue tinted wings has a sparkling gold halo, praying hands and a meshed woven glass gown. 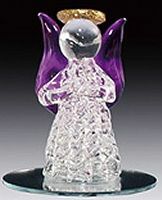 This charming spun glass angel figurine is set on a beveled round mirror base and is perfect for party favors or memorial gifts. October birthstone angel with Garnet (red) tinted wings has a sparkling gold halo, praying hands and a meshed woven glass gown. 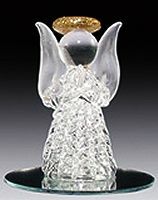 This charming spun glass angel figurine is set on a beveled round mirror base and is perfect for party favors or memorial gifts. November birthstone angel with Citrine (yellow) tinted wings has a sparkling gold halo, praying hands and a meshed woven glass gown. 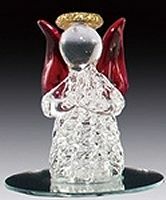 This charming spun glass angel figurine is set on a beveled round mirror base and is perfect for party favors or memorial gifts. December birthstone angel with Sapphire Blue tinted wings has a sparkling gold halo, praying hands and a meshed woven glass gown. 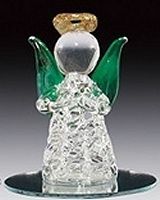 This charming spun glass angel figurine is set on a beveled round mirror base and is perfect for party favors or memorial gifts. Get all the 12 birthstone angels individually boxed in a secure gift box for safe storage and save more than 50% off the regular retail price. 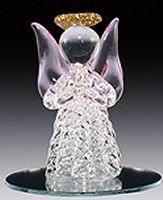 These endearing spun glass angel figurines are set on a beveled round mirror base and are very popular party favors or memorial gifts.